The compact M-Audio® Axiom® 25 mobile controller combines all the production power and performance you need to get the most from your music software and MIDI gear. The compact M-Audio® Axiom® 25 mobile controller combines all the production power and performance you need to get the most from your music software and MIDI gear. 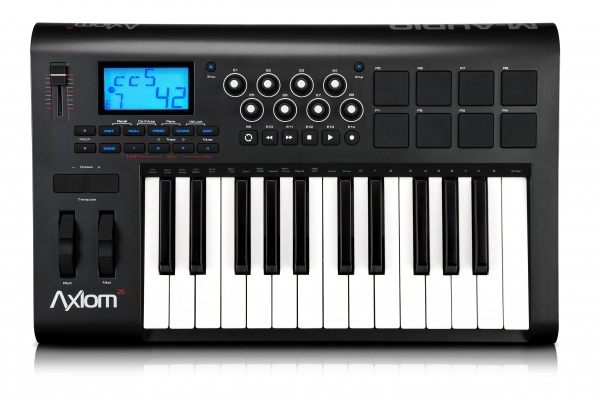 More than just a “data entry” controller, the Axiom 25 features piano-style, semi-weighted keys for a musically satisfying playing experience—yet it’s small enough to fit in a backpack. Large dynamic trigger pads make it easy to program beats and trigger one-shot samples—while the encoder knobs and buttons deliver complete real-time control over your software. DirectLink mode provides easy, automatic access to common DAW functions* including transport, mixer, track pan, and virtual instrument parameters—no complicated setup required. The Axiom 25 controller even features a sleek, angled top panel for easy viewing in any environment.